The garden season is upon us and one of the most important things we all have to have in the garden is good dirt. And one way to get really good dirt is through compost. But, before we talk “dirt”, here is a quick tip on what to do in your garden if you see the temps are going to dip pretty low or if a frost is coming. Frost will burn a plant very easily and covering the plants will help. I have a stash of old sheets just for this job. You can find so many cheap sheets are your local Goodwill. NEVER use plastic to cover your plants. As long as the temp doesn’t go below 29 degrees for a long period of time, the plants should be fine if covered. If you do cover your plants, please go out when the temp is high enough and pull off your coverings. If you let your plants sit under that protection for too long, the sun will cook them. NEVER use plastic to cover your plants. I have lived and learned that! If you have to harvest any tomatoes early because of a cold snap, here is how to get them to turn red easily. I just put them in a plastic container or closed paper bag and let them sit for a few days. You can put an apple in the container with the tomatoes to help the process faster. 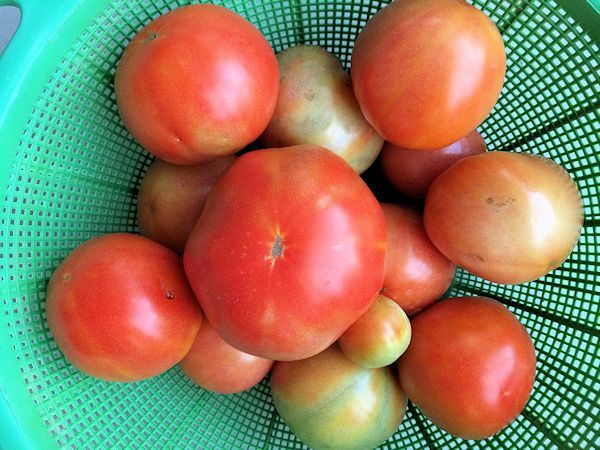 Don’t wash your tomatoes (just wipe them off) or put them in the fridge before you eat them. Tomatoes to best just sitting in the kitchen until needed. 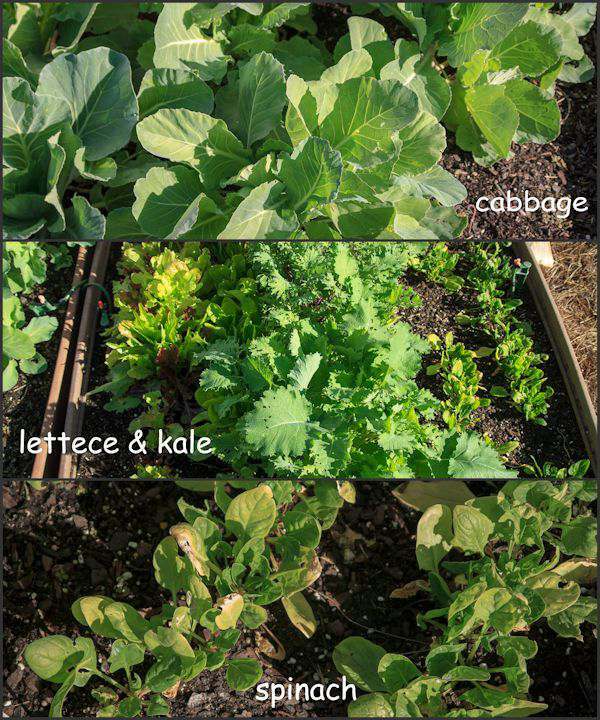 All the cool plants, such as spinach, kale, cabbage, lettuce, and kale will just love the frost and cold. You never have to worry about covering them. So, let’s talk some compost! Composting is a very important part of your garden and can be done all year long. Take your garden and kitchen scraps and let them break down with other yard materials will make your garden rich in nutrients. Every season, your garden eats up what the dirt has to offer. It must be replenished and compost is the best way to do it. It’s easy to do and if done correctly, isn’t stinky. My compost buckets are next to my house and when I go out of the garden, I have never smelled anything. Your compost pile can be as elaborate or simple as you like. For me, it’s really simple and basic. This is my compost area. For those who are new readers, my garden size is 4′ by 12′ raised beds. So, I don’t need a huge compost area. 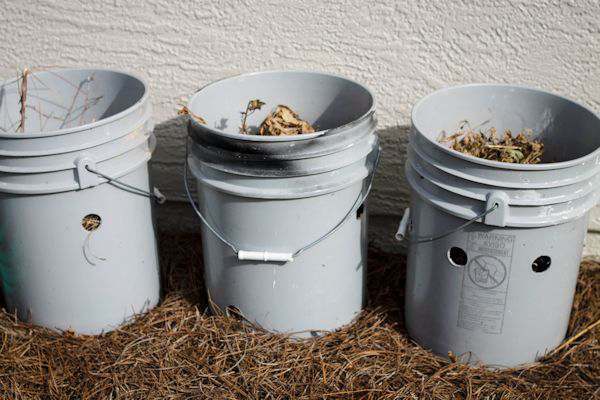 3 – 5 gallon used and clean paint buckets which my hubby drilled large holes in the sides and bottom. They sit next to the garden area and when I clean up the garden, I just toss the scraps in the buckets. I started this last year and as you can see the top part isn’t ready to be used yet. I will pour out the 3 buckets in my wheel barrel, stir up the compost a bit and return it all back into the buckets. During the spring, I will keep adding more scraps and clippings and by this fall, I should have good compost for my garden. Nature does most of the hard work for me. Any vegetable scraps and peelings, leaves, garden, plant and grass clippings, used tea and coffee grounds, farm animal manure and eggshells which have been washed clean. Anything “green” as in “plants” works best. Any animal products such as meat, poultry, pork, fish or bones from animals. Any kind of animal protein will cause your compost to smell and cause “creatures” to dig around in there. I know you don’t want raccoons, stray dogs and cats, skunks and other vermin in your yard. DO NOT add cat or dog feces!! They will only cause disease and parasites. Rain and sun will help your compost best, but you do need to turn your pile every few months. If you aren’t having a lot of rain, just turn the hose on your piles. If you see bugs, great!! Bugs are your friend because they help break down your piles even more. Put some worms in your piles too!! More than likely you haven’t turned your pile in a while and it needs air. Don’t add too much of one thing. Ex: grass clippings or dead leaves. If you just added manure will make your piles smell bad. There are several types of compost bins out there if you don’t want to have open piles somewhere in your yard. If you have a really large garden, you would need to make your compost piles on the ground. 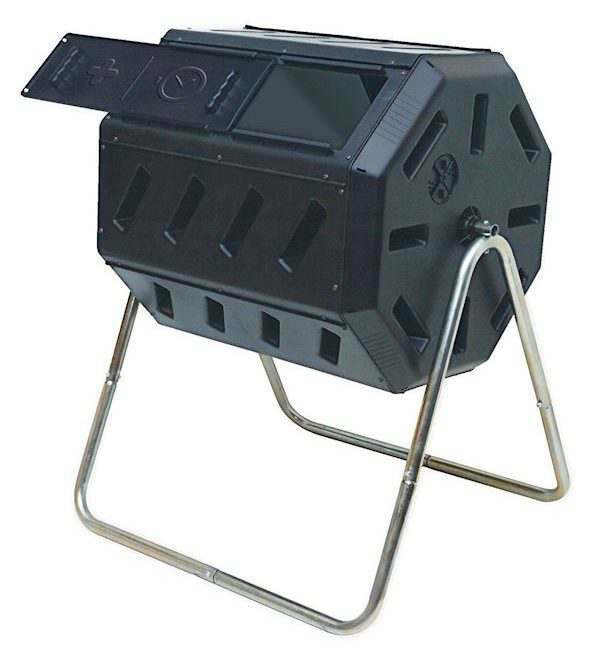 But for smaller gardens, here are some compost bins to choose from. This compost bin sits on the ground. Just add your scraps and then your compost comes out the bottom. You would have to turn the compost every few months. I really like how this bin works because you can constantly turn your compost without having to do this process by hand. Sounds like my kind of compost bin and is on my garden list of items to purchase in the future. 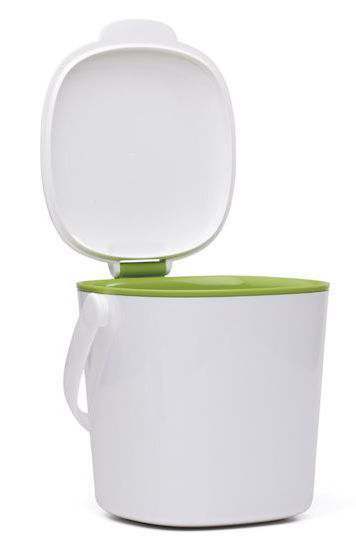 Easy to assemble compost bin and also nice looking in your garden. What I love about this one is the top comes off easily and the front opens up to shovel out your compost and to turn it. I have a kitchen countertop compost bin which I throw my food scraps from the kitchen in and I don’t have to go out to the garden every day. This bin washes up so nicely and the top comes off easily. Looks nice in my kitchen too. Composting doesn’t cost anything to add “plant” material to your piles and it adds so much to your garden. It keeps materials out of the landfill and lets nature recycle them into useful nutrients. Composting is easy to learn, easy to do, can be any size and a valuable skill for beginners and experienced gardeners. I had no idea that you could compost without the smell. I have always thought that it would smell, so you learn something new every day. Thank you for sharing and I’m looking forward to attempting. My Dad is a keen gardener and would love looking at and comparing all these compost bins! I’ll send him a link to your post incase he’s looking for a new one! I really wanna start my own garden, it has been something I’ve been wanting to do but felt like I wouldn’t be able to maintain them and keep everything alive but you totally gave me the push. A truly informative, well written article. Learned so much about composting. Such useful info. My daughter-in-law always composts for her garden. Her dedication is inspiring and we will be doing the same when we move from the condo to a house. This is great! Very informative regarding compost bins. 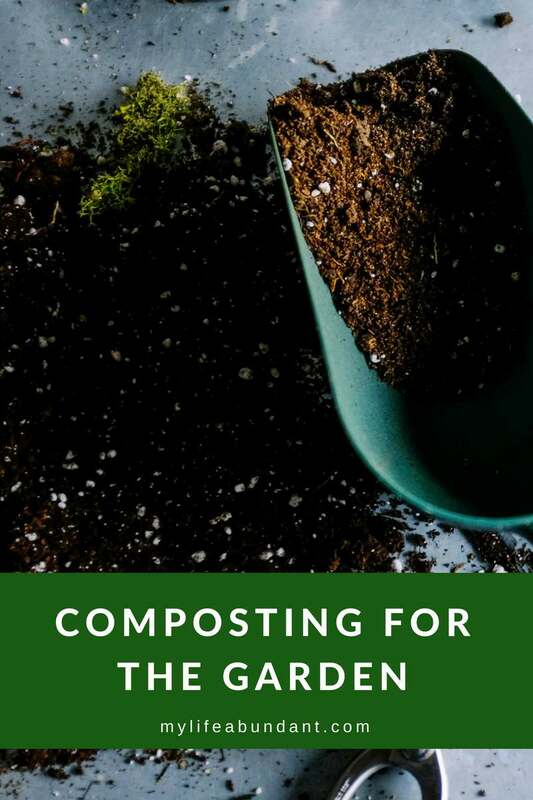 I’d love to do a compost and these are some great tips! But first I need a better garden, haha. Thanks for sharing. Never known so much about composting. Such an informative post.Thanks for sharing. I used to do composting when I was in primary school. I really like the information. I keep a small compost bucket in my kitchen to put eggshells, “green” scraps, and peels in. When it is full or every 3 days we take it outside and add the contents to our compost. We have found that onions do not make for good compost. They smell and worms don’t seem to like them.